Projects are done on new-age open source in in-house designed development boards. 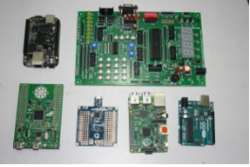 Boards employed include Arduino Uno, Raspberry Pi, AVR, Beagle Bone and others. Devise Electronics is a young and growing organization providing services and developing solutions in the many domains catered by electronics. We focus on the niche segment of automotive electronics and leading research and development activities across the space of the automotive industry. Devise was founded by Mr. Shekhar Malani in 2013 after more than 10 years of work experience in USA and India in automotive controls domain. Devise currently has a network of industry experts and management professionals with cumulative 100+ years of work experience.